You sure wouldn’t think there would be anything wrong with the Diamondbacks. They currently have the best record in the National League by multiple games, and even after a loss on Wednesday, there’s an eight-game gap between them and the Dodgers with almost a quarter of the season already gone. They survived the absence of Steven Souza Jr. They’re actively surviving the absence of Jake Lamb. They’ll try to continue to survive the absence of Taijuan Walker. No team ever stays totally healthy. And one of the big early stories has been the breakthrough by Patrick Corbin. After eight starts, Corbin owns a 2.12 ERA, with an easy career-high rate of strikeouts. The biggest change for Corbin has been an increased reliance on his best pitch — his slider. He’s now throwing the pitch at multiple speeds, sort of going the way of Rich Hill or Lance McCullers. Corbin is setting himself up for an offseason payday. And on the surface, he’s cruising, having allowed just two runs over his last two starts. Yet something underneath is incredibly worrisome. Something fundamental to the very idea of pitching. Corbin has suddenly lost his zip. No one would do that on purpose. I’ll repeat: Corbin has allowed a total of two runs over his last two starts, spanning 11 innings. He’s struck out a dozen batters. Zach Buchanan just wrote about him at The Athletic, and Corbin insists he’s okay. Corbin said his arm feels fine, and Lovullo said he has no reason to doubt the 28-year-old lefty’s forthrightness. Corbin did take a glancing line drive off the left hand late in his last start before doubling up on the Dodgers, but he said it has not affected him since. Corbin figures this is just a blip. If it is, then everything will be fine. He’s gotten his outs, even at his lower speeds. And obviously, from where I’m sitting, I can’t examine Corbin’s body like a doctor. There’s always the chance something like this is insignificant. But I should specify what “this” is in the first place. Why am I alarmed? 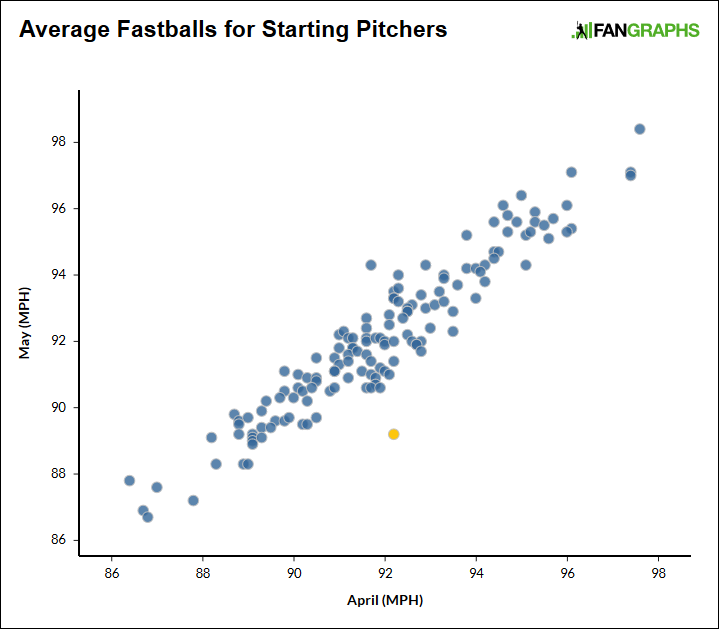 In this plot, you see average April and May fastball velocities for starting pitchers. Corbin is the point in yellow. We’re looking at a sample of 145 pitchers. On average, between months, they’ve gained 0.2 miles per hour. Corbin has lost 3.0 miles per hour. That’s more than a tick and a half away from the next-greatest loss. When someone dips a little bit — you can forgive when someone dips a little bit. Corbin has dipped a lot of bit. His velocity was notably down in his previous start, and then, Wednesday evening, it didn’t recover. Here’s what Corbin’s two-game rolling averages look like for his career. That rise in the latter part of 2016 corresponds to when Corbin was demoted to the bullpen. It’s already plainly obvious that Corbin is missing something, but I might as well drill the point home. 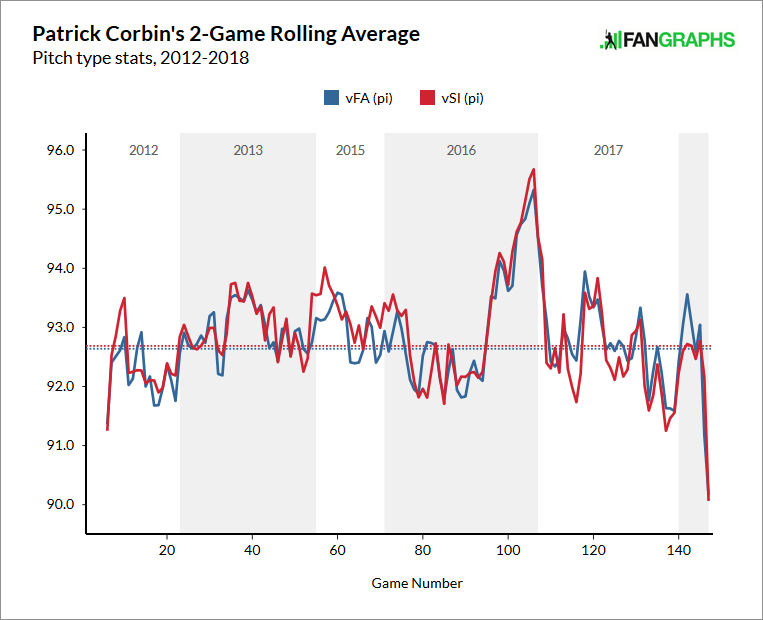 In this last plot, you see Corbin’s eight starts from this season. There are three lines. One shows Corbin’s overall average fastball velocity. Another shows the average velocity of his ten hardest fastballs. And the third line simply shows Corbin’s velocity max. 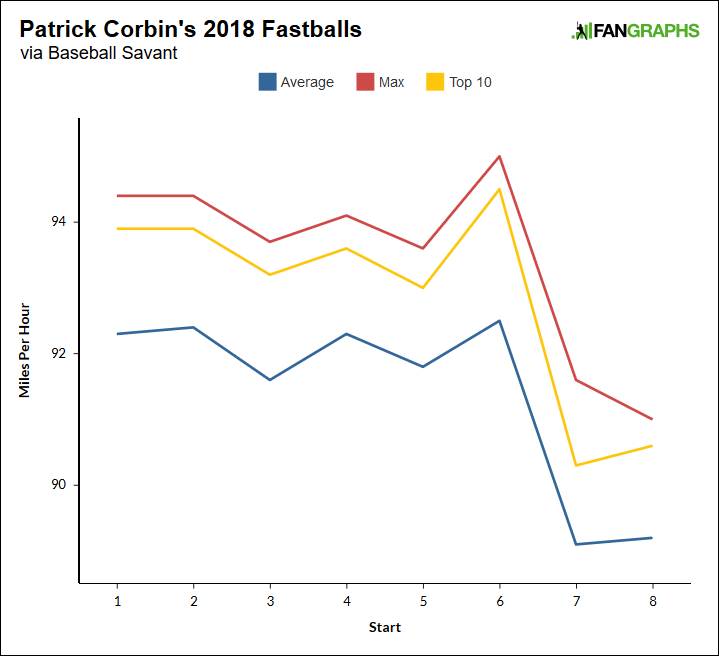 Over six starts, Corbin was averaging a little better than 92. The past two times out, however, he hasn’t touched 92. Sometimes a pitcher might dial it back intentionally, for one reason or another, but you’d still expect that guy to occasionally air it out, when the pressure is on. Corbin hasn’t aired it out, which calls into question whether he can. When a pitcher suddenly can’t throw as hard as he used to, there’s the strong possibility that something about his body isn’t letting him. Looking at month-to-month splits isn’t perfect, but it works as a proxy. Last year, from one month to the next, there were two cases of starting pitchers who lost about three miles per hour or more. Adam Wainwright lost his zip between July and August, and he went on the DL with an elbow impingement. Hector Santiago lost his zip between June and July, and he went on the DL with back and shoulder problems. Sometimes, these issues might be mechanical. Very often, though, there can be an injury. Pitchers get injured. Especially pitchers who have already been significantly injured, like Corbin. It shouldn’t be a surprise when something pops up. And for whatever it’s worth, it’s not as if velocity is the only issue. Against the Dodgers on Wednesday, Corbin barely threw even half of his pitches for strikes. He threw 14 pitches recorded as being in the dirt, with a previous season high of only seven. Corbin throws a lot of sliders, yes, and he throws a lot of those sliders below the zone, but Wednesday, he didn’t have his usual slider control. There are warning lights everywhere, and while Corbin has expressed that he’s sound, pitchers don’t always know when something is wrong. And even when they do, they don’t always say as much to the press. Corbin is worrisome for two reasons. One, he’s just good, and the Diamondbacks would like to keep having and using a good pitcher. But two, Arizona already has a real issue with rotation depth. Walker is out for the season. Robbie Ray has a strained oblique. Braden Shipley was recently placed on the DL with elbow inflammation. Matt Koch is already up and starting, having taken Walker’s place. Kris Medlen looked bad in his first opportunity. Shelby Miller is still working back from Tommy John. The club recently gave a minor-league contract to Clay Buchholz. The Diamondbacks knew, even in spring, that their strong starting rotation was also going to be thin. The depth has already been tested, and something being wrong with Corbin would deal them another significant blow. Every single time a post like this gets written, it needs to be expressed that, ultimately, we don’t and can’t know. Corbin might be fine. Maybe he’s under the weather. Maybe it’s just a run-of-the-mill dead-arm phase. But the cause for alarm is very much legitimate. All of a sudden, Patrick Corbin can’t throw a single fastball at the speed he used to average. That’s not something any pitcher would choose. We hoped you liked reading The Diamondbacks Could Have a Patrick Corbin Problem by Jeff Sullivan! Just a quick look at 2017, it looks like the spikes correspond to getting more rest, and he finished 2016 out of the pen. This year up until the Nats game, he had been getting 5+ days rest based on schedule. He went into that on 4, and was on 4 for his last start. Could just be one of those guys better suited for 5 days instead of 4. But also could be showing symptoms of a developing injury. Interesting theory, but baseballreference and Brooksbaseball both have his last start being on 5 days. I was looking to see if the opposing pitcher (both Alex Wood) also suffered a decline in velocity, perhaps indicating the machine needed recalibration, but Alex Wood increased his velocity in May compared to April.